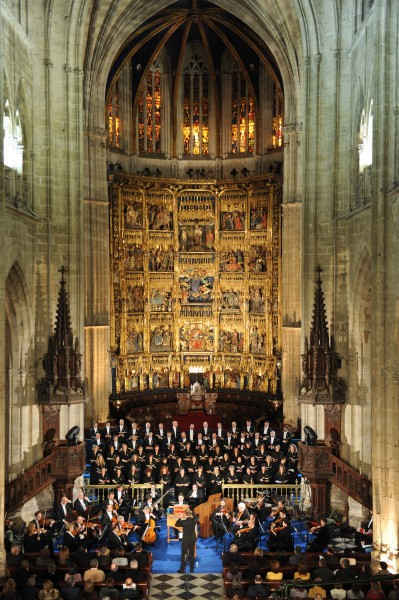 The Prince of Asturias Foundation Choir, under the baton of maestro Benjamin Bayl and alongside the Principality of Asturias Symphony Orchestra (OSPA), performed Handel’s Messiah in the traditional Christmas concert for the twenty-fifth consecutive year on 17th and 18th December. The concerts were be held at 8 p.m. at the Cathedral of Oviedo and at the Theatre of the Laboral in Gijón on 17th and 18th December respectively. Voices from different countries of the European Union performed in the concert titled "Europe hails Christmas: The Messiah". The performance featured soprano Malin Christensson, mezzo Madeleine Shaw, tenor Nicholas Mulroy and bass Tim Mirfin. The Messiah, masterpiece of symphonic-choral music, has become the most renowned piece of Georg Friedrich Haendel´s (1685-1759) oratorios. The work for soprano, alto, tenor and bass soloists, choir of four voices and orchestra was written between the 22nd August and 14th September 1741, with libretto by Charles Jennes following the biblical text. The first public concert of The Messiah was held on the 10th April 1742, four days before its opening at Dublin´s William Neal Music Hall. The piece is divided into three parts that form the liturgical year, through the different stages in the life and death of Christ. Benjamin Bayl. Founder and conductor of The Saraband Consort ensemble, which made its debut at the Wigmore Hall and performed in several festivals, Benjamin Bayl studied organ at the King’s College in Cambridge. He also studied at the Guildhall School of Music & Drama, The National Opera Studio, the Schola Cantorum Basel and the Royal Academy of Music, where he studied orchestra conduction with Colin Metters, Sir Colin Davis and George Hurst, with the Sir Charles Mackerras scholarship. Due to his knowledge and experience in working with ensembles, modern orchestras and opera theatres, Benjamin Bayl obtained the support of important figures such as Sir John Eliot Gardiner, Ivor Bolton, Ivan Fischer, Harry Bicket, Paul McCreesh and Lars Ulrik Mortensen. Some of Bayl’s last performances were Ariodante with the English Touring Opera and premieres with the Opera Australia (a new production of Orlando) and the Royal Philharmonic Orchestra. Last year he conducted the opening and closing ceremonies of the World Youth Day in Sidney, in the presence of His Holiness the Pope. He premiered Bach’s Christmas Oratorio with the Symfoniorkestern NorrlandsOpera last December, and was invited to conduct Haendel’s Messiah for the 2010/11 season. Benjamin Bayl recorded his first album as conductor with pieces by Hindemith, with the Britten Symphony, which was awarded five stars at the BBC Music Magazine. He also conducted the European premiere of Sir John Tavener’s Lament for Jerusalem, with the Orchestra of the City and the Rodolfus Choir and has conducted pieces by Einojuhani Rautavaara, Elliott Carter, Judith Weir and Jonathan Dove. He recently made his debut in Spain conducting Hita’s Briseida at the Santiago Festival with La Grande Chapelle; and has also conducted the following ensembles: Orquesta Victoria, The King’s Consort, Iford Opera, Bampton Classical Opera, Opera East, Guildford Philharmonic and several concerts with the Orchestra of the City as musical director. Bayl has worked broadly in opera and oratorio as assistant conductor, which allowed him to work in many opera theatres and with many renowned conductors. Benjamin Bayl was the Choir Maestro of the Holland Park Opera for two seasons. He has been a music producer at the Covent Garden and assistant conductor of the British Youth Opera, premiering at the Queen Elizabeth Hall with Britten’s A Midsummer Night’s Dream. Maestro Bayl has also worked with a large number of European music ensembles as keyboard player. Principality of Asturias Symphony Orchestra (OSPA). The Orchestra made its official debut under the baton of Amalio López in January 1940. It has performed in more than a hundred concerts since then and participated in the Oviedo Opera Season. Its first recordings targeted Asturian music with a recording alongside Maestro Valdés entirely dedicated to the music by Julián Orbón and The Celtic night. The orchestra has also made a CD called Vivir para cantarlo (a play on words, "to live to tell the tale" transforms into "to live to sing about it" with a single letter change in Spanish) which was recorded live with Victor Manuel. It has recorded Beethoven´s and Mendelssohn´s violin concerts with Elmar Oliveira for Artek as well.